Of the major synth manufacturers, Korg seem to be the most likely to do something unexpected or in a manner that’s not quite what one might have anticipated. 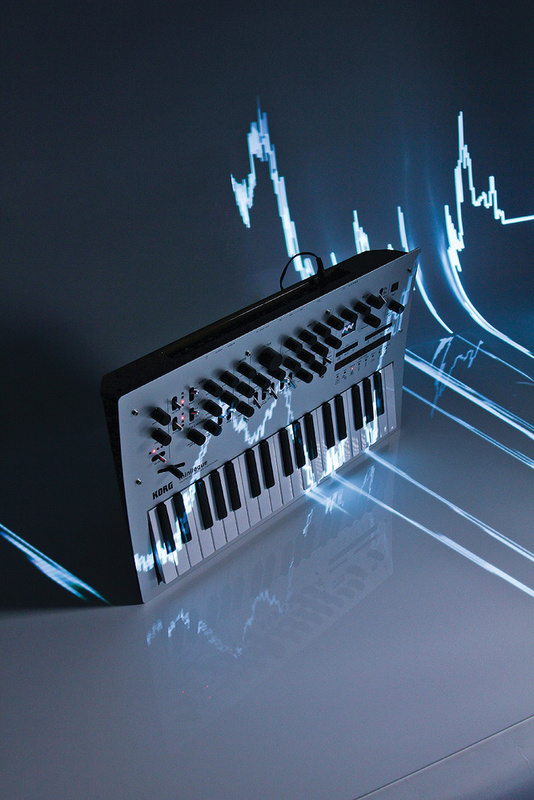 In recent years, the Kaoss products, the Monotron and the announcement of the Korg ARP Odyssey all caught the world unawares and, although industry watchers sniffed something in the air when the company trademarked the Minilogue name in 2015, none of the ensuing speculation (or, at least, none at the time of writing) foresaw what you now see before you. With its swept control panel and the almost obligatory lump of wood acting as a rear-panel decoration (rather than the usual end-cheek or two), it’s one of the most distinctive small synths of recent years, and possibly one of the most attractive. And, while its looks shriek ‘virtual analogue’, the signal path is genuine analogue, which is going to attract a lot of interest. First things first: the Minilogue is a single–channel, mono–timbral, four–voice analogue/digital hybrid polysynth with various duophonic and monophonic options. Each voice offers two VCOs plus white noise, a low–pass VCF and an audio VCA, all modulated by a digitally generated LFO and shaped by dual, digitally generated ADSR envelopes. It’s a simple but classic voice architecture, although Korg have enhanced it with some interesting twists that we’ll address in due course. The oscillators offer four octave settings that prove to be 16’, 8’, 4’ and 2’ when the independent tuning knobs for each oscillator (which offer detune as fine as ±1 cent and as coarse as ±1 octave) are set to zero and the global octave switch is set to the middle of its five positions. Well, that’s not quite true, because the sawtooth wave sits an octave above the pulse and triangle waves unless you modify it using waveshaping (which we’ll come to in a moment). But, even ignoring this anomaly, sounds can range from almost subsonic at the bottom end to almost supersonic at the top, even when confined to the Minilogue’s three–octave keyboard. You can only select one of the three waveforms for a given oscillator at any given time, but there’s waveshaping available for each, applied manually via the Shape knobs or controlled by the LFO for dynamic effects. The shaping applied to the pulse wave is simple to explain: it’s pulse width when controlled by the knob, and PWM when controlled by the LFO, and it generates the usual range of sounds. It’s harder to explain the waveshaping of the sawtooth and triangle waves but, when Arturia bent their MiniBrute waveforms in a similar manner, they gave the functions names such as Ultrasaw and Metalizer, which gave you an idea of what you were going to hear. I’ll leave it to Korg’s marketing department to come up with equivalents. Unfortunately, you can’t apply LFO–driven waveshaping to one oscillator and not the other, which precludes patches that mix sawtooth and PWM waves for ensemble sounds, and you can’t use the LFO to modulate the pitch of one oscillator but not the other, which precludes many chorus patches. Nonetheless, the oscillator section is more powerful than you might expect because it offers cross modulation (FM) and oscillator sync (both with VCO2 as carrier and VCO1 as modulator), plus a ring modulator, the output of which uses the VCO2 input in the mixer so that you can combine the signal from VCO1 with the output from the modulator. There’s nothing stopping you from invoking these in any combination, although, even with extreme settings, everything remains well behaved — in the area of useful sound effects rather than sonic mayhem. Unfortunately, there seems to be a problem with the sync when used with certain combinations of pitches, pitch sweeps and waveforms. If you set up a standard hard-sync patch with the assignable EG sweeping the pitch of VCO2, everything goes swimmingly until the sweep approaches zero, at which point there’s a discontinuity in the sound. You can often eliminate this by tweaking the amount of sweep or adjusting the relative tuning, or by selecting the sawtooth as the carrier but, of course, that may not be what you want for that patch. The outputs from the oscillators and the noise generator are mixed before being fed to the input of the switchable 12dB or 24dB/octave low–pass filter, which I found to have a cutoff range in either mode of almost precisely 20Hz to 20kHz. The cutoff control boasts the largest knob on the panel, and there are additional controls for the amount of resonance and the amount and polarity by which the assignable EG affects the cutoff frequency. There are three keyboard tracking modes (0, 50 and 100 percent) and three velocity modes (also called 0, 50 and 100 percent), the latter of which affect the cutoff frequency directly, not the amount by which the contour generator is applied. With the resonance set higher than the two o’clock position and the keyboard tracking at 100 percent, it’s possible in either mode to play the four self–oscillating filters like a set of slightly wonky, out–of–tune oscillators. You can invoke the auto–tune routine to keep them in tune and scaled but, once they’ve drifted a little, you can create some nice, eerie patches, just as on vintage synths with the same facilities. The signal now passes to the audio VCA. This, at first, appears to be affected only by its dedicated ADSR contour generator. This is because Korg decided to omit the physical on/off switch and relegate the velocity/loudness relationship to a menu! When enabled, velocity affects the amplitude of the ADSR contour applied to the VCA gain, as it should. The outputs from the four voices are summed in one of eight ways (known as Voice Modes) before being passed to the output section. The operations of some of these modes are obvious — for example, Poly is the four–voice polyphonic mode, Unison plays all four voices under a single key, and Arp invokes the arpeggiator. Others are less straightforward, so I’ve summarised them, together with the effect of the single parameter available to each (the Voice Mode Depth) in the table in the ‘Voice Modes’ box. The audio is then passed to the output section, which comprises an analogue high–pass filter combined with a digital delay line and its associated feedback loop. There are three places from which you can tap the audio from this section. Firstly, you can bypass the delay and send the signal from the audio VCA directly to the socket on the rear of the synth. Alternatively, you can tap the output from the audio VCA together with the audio generated by the HPF/delay loop, resulting in a full–bodied original followed by progressively thinner echoes. Lastly, you can pass the output from the VCA through the HPF to suppress the lower harmonics of the original sound as well as the repeats. If you select the last of these but don’t apply any delay, you can combine the HPF with the LPFs in the main voicing architecture to obtain band–pass filtering, which is a useful bonus. The delay line itself offers just delay time and feedback gain controls, so it’s equivalent to the simplest stompboxes and single–head tape delays. Nonetheless, it’s capable of a range of quasi–reverberant effects as well as standard echoes and delays. What’s more, with a maximum feedback gain of a tad greater than unity, you can generate all manner of ’50s sci–fi effects. The Minilogue’s (surprisingly few) sockets are all to be found recessed into the wooden rear panel. Once you’ve created your sonic masterpiece, you’ll want to be able to control it, but the Minilogue is almost devoid of performance facilities. Aftertouch isn’t provided from the keyboard or over MIDI, and Korg have eschewed the usual performance controls, substituting a single sprung slider that lies at about 15 degrees to the left/right axis of the instrument. You can direct just one from a list of 29 parameters to this, ranging from pitch–bend and various oscillator, filter and contour settings, to things such as the delay time or feedback amount, or Voice Mode Depth. Many of Korg’s vintage analogue synths allowed you to apply pitch–bend (left/right) and two types of modulation (forward/backward) to a sound, and it’s a shame that the Minilogue doesn’t do likewise. On the other hand, every Minilogue patch (called a Program in Korg–speak) contains its own sequence. Recording and overdubbing real–time sequences couldn’t be simpler: while the sequencer is playing, just press Rec, and play. Your performance will be quantised and dropped into the (maximum) 16 available steps, and you can overdub as it loops, up to a maximum of four notes per step. If you don’t like the result, press and hold Rest while looping to eliminate what you’ve recorded. You can also record up to four motion sequences (sequences that contain changes to one of the top-panel control values) within each Program. Recording in step mode is equally straightforward: determine the length of the sequence, press Rec when the sequencer is not playing, and then play the requisite number of notes and/or chords. The screen will show you what’s stored in each step, and it’s then simple to replace individual steps should you want. In addition to notes, you can record rests and ties, as well as determine the Gate Time on a note–by–note basis. The last of these requires numerous button pushes but works if you’re prepared to put the time in. There are 200 memories in the Minilogue: 100 preset factory sounds that you can’t overwrite, and 100 user memories. When I received the synth, I worked my way through all 100 of its presets, which demonstrated its capabilities in a variety of monophonic and polyphonic roles. Then I discovered how to load the current panel settings into the edit buffer and started to program various monophonic patches from scratch, and was overtaken by an overwhelming urge to compare these with the same sounds produced by my four–voice Korg Mono/Poly. The results were fascinating. Initially eschewing complexities such as cross modulation and sync, I was able to create all manner of single–oscillator patches on each that were remarkably similar to one another. Brass, flutes, leads, basses... the Minilogue was proving to be much the equal of its ancestor. Adding a second oscillator on the Mono/Poly and selecting Duo mode on the Minilogue reinforced the similarities, although this was one area in which the vintage synth demonstrated its occasional superiority by allowing me to mix PWM with other waves. On the other hand, the Minilogue would have stepped way beyond the Mono/Poly had I chosen to invoke its triangle and sawtooth waveshaping. Next, I compared some cross-modulated and sync sounds. The results weren’t always identical, but again I was surprised by how similar I could make them. The factory presets had strongly influenced my initial perceptions of the Minilogue but, in my view, there’s a better (or, at least, more appealing to an old fart) synth within, waiting for the opportunity to burst forth. When I placed both instruments into polyphonic mode, the truly polyphonic, dual–oscillator architecture of the Minilogue hugely outreached the paraphonic Mono/Poly, so I found myself wondering how it would compare with one of Korg’s more recent four–voice polysynths, the MS2000. Despite their rather different architectures and control surfaces, I was again surprised to find that I could make basic patches sound all but indistinguishable on each, which is a compliment to Korg’s modelling algorithms. But as I extended the complexity of my sounds, the characters of the two instruments started to diverge from one another. This was particularly noticeable when programming modulated sounds. The Minilogue isn’t heavily endowed with modulation capabilities and, in addition to its waveshaping and pitch modulation duties, its single LFO per voice (which generates only sawtooth, triangle and square waves, and offers no niceties such as noise modulation or sample & hold) has only one other destination: the cutoff frequency of the filter. What’s more, only one waveform and only one destination are available to it at any given time. And, while the assignable EG can affect the LFO rate and intensity, it can only control one of these at a time. Clearly, Korg’s four–voice VA synth engine is a very different beastie, so I decided not to pursue this comparison any further. 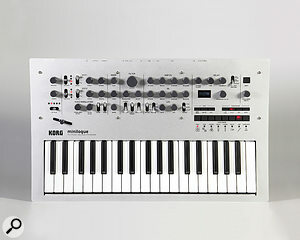 The Minilogue’s front panel measures 50 by 30 cm. Despite these limitations, I was surprised to discover how flexible the Minilogue can be, although there are several things that I might have done differently had I been one of its designers. For example, there are some hidden functions accessed using the Shift key, so I would have silk–screened them on to the panel. I would also have tried to devise a mechanism to enable users to jump directly to a given patch without using a MIDI message (currently, you can only save eight favourites or step through the memory in increments of one or 10), and I would have attempted to include a software LFO to modulate the delay time for basic chorus and flanging effects. I would also have included MIDI Overflow so that users could chain two or more units. In addition, an internal power supply would have made the whole package feel more ‘pro’, although I have to admit to being impressed by the solidity of the instrument, and in particular the control panel’s knobs and switches, which feel much smoother and more solid than the Minilogue’s price might lead you to expect. But then we come to its ‘slim’ keyboard, on which a standard octave width spans roughly a 10th — say, from C to E rather than C to C. I understand that many people nowadays use synth keys as triggers rather than as the means for playing conventional keyboard parts and widdly–widdly solos, but I have to admit that I’m becoming sick of these abominations. (The keys, not the widdly solos.) A normal keyboard allows you to pursue both approaches to making music whereas a slim keyboard allows only one, and I feel that the synthesizer inside the Minilogue deserves better. So why do it? 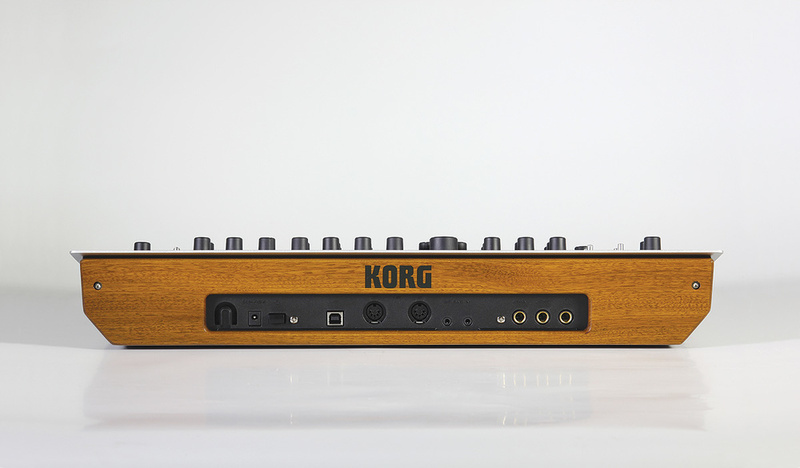 Although many manufacturers are now using miniature keybeds, I put this question to Korg and they responded, “It’s a form factor that’s increasingly compatible with a lot of studio environments with less space. We feel that the idea of a ‘go to’ master synth is less relevant today (although there is a place for that too), and the Minilogue at this price and polyphony is not really about that. It’s inevitable that a few people are going to be unhappy with scaled-down keys, but we believe that our slim keys are the best choice for bringing top analogue sound to a diverse range of players and studio spaces.” Obviously, I disagree. A standard keyboard spanning a little over two–and–a–half octaves (C to G) is almost exactly the same width as Korg’s three–octave slim keyboard and, for me, that would be by far the better choice. But my biggest issue with the Minilogue is its MIDI implementation. I conducted most of this review with the Minilogue perched on the laptop extension of an Arturia KeyLab 88 MIDI controller, which would have worked perfectly had Korg’s engineers not chosen to ignore the standard MIDI CC map and substitute new destinations for every controller. I discovered this when I trod on the Arturia’s sustain pedal and, rather than obtaining a sustained sound, heard one of the oscillators jump up a few octaves. I checked that I hadn’t done anything stupid (I hadn’t) so I inspected the Minilogue’s CC list. I was stunned. For example, CC1 (modulation amount) is directed to noise level, CC2 (breath control) is directed to VCO1 pitch, CC7 (volume) is directed to VCO1 level, CC64 (sustain) is directed to VCO1 octave, CC65 (portamento on/off) is directed to VCO2 octave, and so it goes on. Everything works as specified, but why was it specified that way? Not just ‘why’, but... WHY? With so many unallocated MIDI CCs and NRPNs available, I’m at a loss to understand this. Not only does it mean that the Minilogue has no sustain function, it means that, when you use the mod wheel or its equivalent on any standard synth connected to it, you just add a large amount of unwanted noise to the patch! Even if you have a MIDI controller that allows you to remap the MIDI CCs sent by its various knobs, sliders, wheels and pedals, you’re still going to have to invest considerable time and effort if you want to use the Minilogue with it. As for using the Minilogue to control other MIDI keyboards or modules, let’s just say that it’s not going to be straightforward! I’ve never been quite sure about mono–timbral four–voice synths. While they are for obvious reasons more affordable than analogue synths with more voices, they have too many oscillators for a single monophonic synth, and too few voices for anything but the simplest polyphonic uses. In the past, the one that worked best for me was the Oberheim 4–Voice, because its dual–oscillator multitimbral architecture was hugely more flexible than, say, the single–oscillator, mono–timbral Roland Jupiter 4 or the paraphonic Korg Mono/Poly. 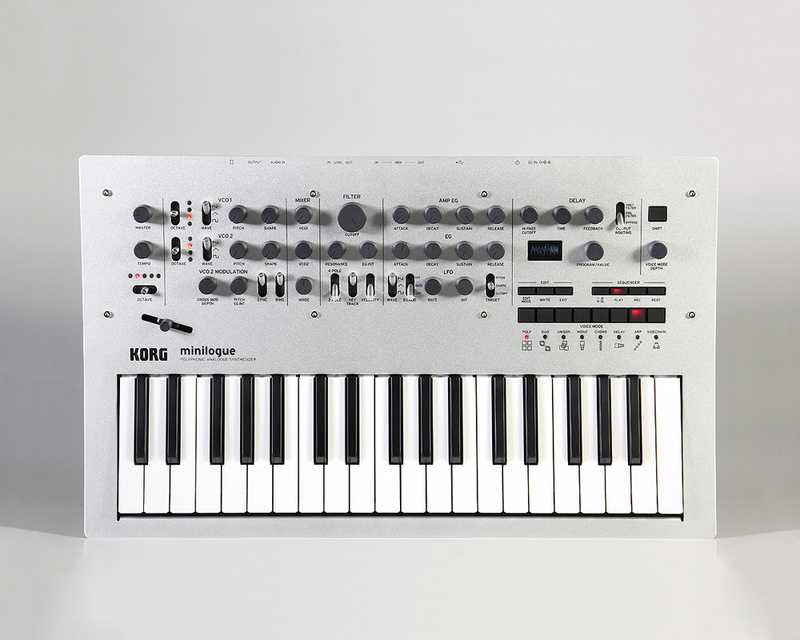 I’m therefore impressed with Korg’s innovative Voice Modes which, while not going as far as permitting multitimbral use, extend the possibilities of the Minilogue far beyond those of a simple four–voice polysynth with a Unison button. In fact, there’s a great deal about the Minilogue that I like. It can sound excellent and, notwithstanding the fact that it’s smaller than I would like, it looks great. So, finally, we come to the issue of cost, and here the Minilogue also scores highly because, with a projected price of just £435$499 or thereabouts, it’s clearly designed to be affordable. However, I suspect that sales will be rather more hampered by its miniature keyboard and limited performance capabilities than Korg would wish. If you’re comfortable with these and its strange MIDI implementation, it’s a cost–effective way to obtain four genuine analogue voices in a very stylish package. If you’re not, a module with standard MIDI CCs or, better still, another model offering a full–sized keyboard and more than one performance control, as well as standard MIDI CCs, would be even better. 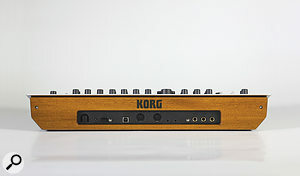 Four–voice analogue/digital hybrids with built–in sequencers of one sort or another are in fashion, and current offerings range from the Akai Timbre Wolf, through the DSI Mopho x4 and Elektron Analog Keys to the Roland JDXA. At around £435$499 (the projected price at the time of writing), the Minilogue is attractively priced and, if it satisfies your needs, possibly offers the best price/performance ratio. Alternatively, you could also consider a low–cost MIDI controller and one or two of the recent Roland Boutique modules, which offer several benefits at the expense of substituting a virtual analogue synth engine for a true analogue signal path. 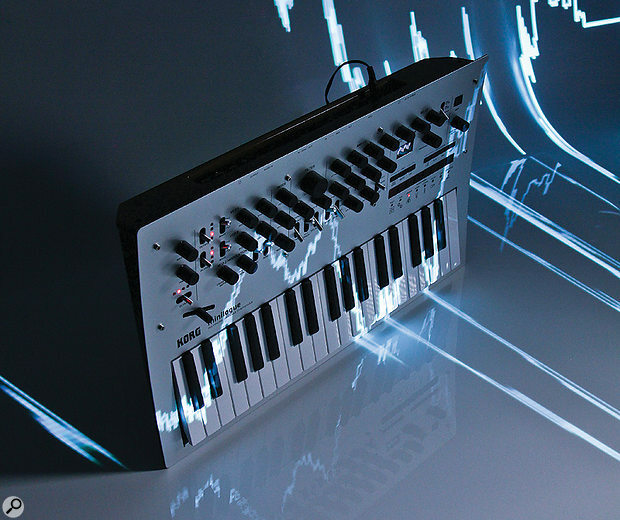 The Minilogue’s Edit Mode comprises three menus containing 45 additional parameters dedicated to the Programs, the Sequencer and the Global setup. Many of these have obvious uses: master tuning, naming patches, MIDI and sync parameters, local on/off, how the knobs respond, and so on. Others provide the only way to control important aspects of the sound. These include things such as the sync modes of the LFOs (which determine whether the four voices are locked to each other and/or the sequencer), the portamento, and whether MIDI velocity affects the loudness of the sound. Yet more provide vital parameters for the sequencer including the length, swing, and gate time. You’re going to become intimately acquainted with these menus, so I find myself wondering whether Korg will release an editor/librarian. It would seem sensible. The Minilogue boasts remarkably few sockets. Audio I/O is limited to a single quarter–inch monophonic output, a single–channel quarter–inch audio input, and a quarter–inch TRS headphone output. Next to these lie 3.5mm Sync In and Out sockets and, to the left of these, you’ll find standard five–pin MIDI In and Out connectors plus a USB ‘B’ socket that carries MIDI but not audio. Lastly, there’s an input for the wall–wart, a cable hook, and an on/off switch. The audio input injects external audio into the signal path before the low–pass filter so that it can be effected in the usual manner. However, there’s no Hold function for the audio VCA, so drones and some other treatments won’t be possible without holding down a key or running the sequencer. Selects inversions of the chords that you play on the keyboard. Duophonic synth with two voices per note. Increases the detuning of the unison pairs. Monosynth with four voices per note. Introduces sub–oscillators one and two octaves below the fundamental. Plays a four–note chord when you play a single key. Monosynth: voices 2, 3, and 4 repeat the notes played on voice 1. Reduces the loudness of an existing note when the next is played. Determines the amount of level reduction. When I first saw the Minilogue’s oscilloscope displayed in its OLED screen, I thought that it was a gimmick, something that a bored programmer had added to kill a few hours on a wet Friday afternoon in downtown Tokyo. However, the more I used the Minilogue, the more I realised that I rather liked it. It doesn’t display the waveform at the synth’s output, but rather (and perhaps more usefully) the output from the most recently played voice, which is then scaled to fit the screen no matter the frequency of the note. The Attack, Decay and Release stages on most analogue synths tend to be curved, which results in smooth transitions from one stage of the contour to the next. This is not the case with the Minilogue, whose contour generators seem to sweep at a constant rate. In most cases this isn’t an issue, but on some patches — and in particular on some sync’ed sounds where you use the assignable EG to control the pitch of VCO2 — you’ll notice that there’s a cusp as the Decay stage progresses into the Sustain phase. The Voice Modes add a lot to its flexibility and usefulness. It’s stylish, light and manageable. The controls feel firm and responsive — not at all lightweight. Its non–standard MIDI CC map means that you can’t easily use it with other devices. You may not wish to use its ‘slim’ keyboard. It suffers from some voicing limitations. The Minilogue is much cheaper than many of the four–voice analogue/digital hybrids from elsewhere, and it can sound great. On the other hand, it offers only a miniature keyboard and incorporates an, um... ‘misguided’ MIDI implementation. If these limitations don’t bother you, I suspect that you’re going to like it a lot. If they do, keep your fingers crossed for a ‘pro’ version.